All value investors today should keep the analogy in mind, and implement the overall concept. 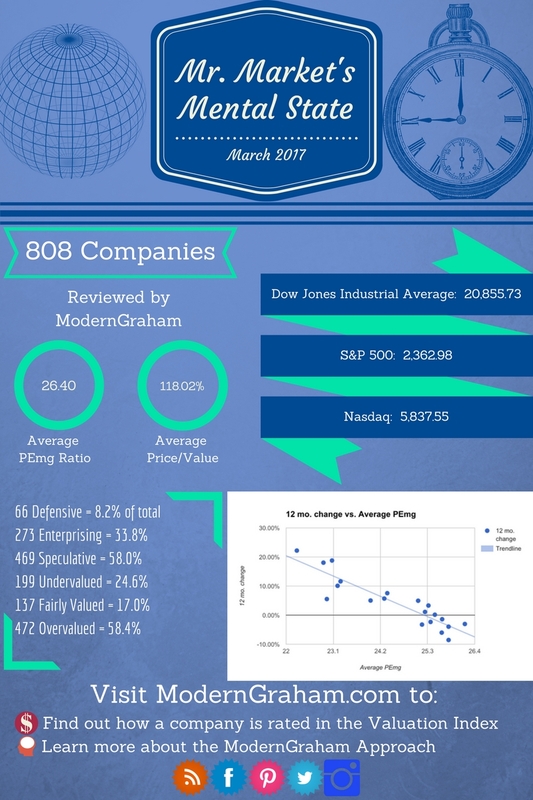 To assist in that goal, ModernGraham has various tools available, and the infographic shown above is one of them, displaying a summary of the valuations of 808 companies reviewed by ModernGraham. This month, out of the 808 companies reviewed by ModernGraham, the average PEmg ratio (price over normalized earnings) is 26.40 and the average company is trading at 118.02% of its intrinsic value. Last month, the average PEmg ratio was 25.54 and the average company was trading at 111.6% of its intrinsic value. The highest PEmg average we have seen while tracking this information was 26.40 in March 2017 while the lowest PEmg average was 22.25 in February 2016. The highest average intrinsic value was 121.72% in January 2017 and the lowest average intrinsic value was 103.19% in February 2016. 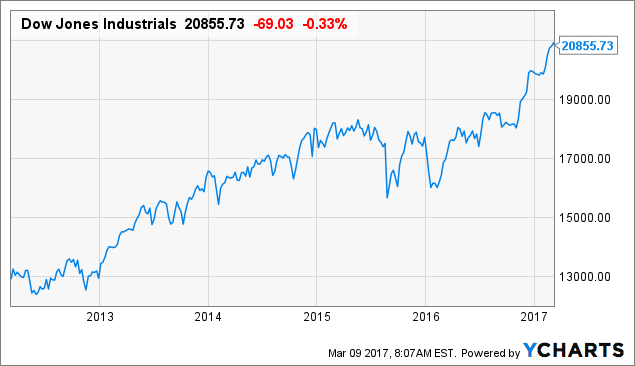 At the time of writing, the Dow Jones Industrial Average (DJIA) was at 20,855.73. The ModernGraham Valuation of the DJIA was 19,539.14. As a result, the DJIA was trading at 106.74% of its estimated value. This figure is within the ModernGraham margin of error, and therefore it appears the DJIA is presently fairly valued. I think you meant Boeing yield 3.1% not 2.1%. Love your work.